This is a fun game where you find out more about people than you might have wanted to know. It can be played inside or out, but you will need a big space. It's set up like a game of musical chairs. Everyone has a chair except one person who will be the starter. The starter stands in the middle, and the others sit down in a circle around the starter. 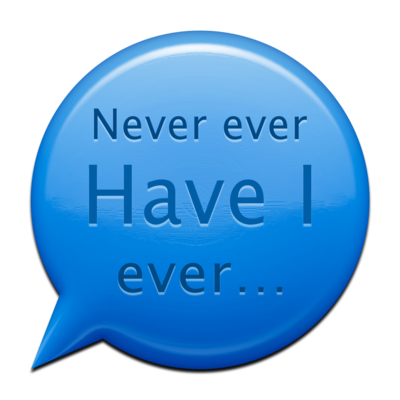 The starter now says "Never ever have I ever..." and then says something they have never done. Anyone sitting down who HAS done that thing must stand up and switch chairs. The person in the middle can grab a chair at this point. The last person standing is the next person to say "Never ever have I ever.." and repeats the game. This game can become very embarrassing for some people, but it's a lot of fun! There are many variation to this game. 2. You can be sitting in chairs, sitting on the ground/floor, standing in a circle, sitting at desks in a classroom, or even laying down. 3. Another fun thing is to get people to jump up and down or hop on one foot or touch their noses or dance around or whatever. You can pick a different action everytime so it's like "Jump if you have never been out of the country", "Dance if you like rap music", "stand on one foot if you ever skinny dipped", etc. I've played this game many different times. We've always called it "Mail call" and there is a person standing in the middle. That person says her name, a fact about him/her self, and says "I have mail for anyone who ________." It is an awesome ice-breaker! Great for large crowds! Everyone goes crazy trying to find a seat. And the person that doesnt find a seat, is the mail-caller. this is my favourite game only i do the drinking version. its great if you want to dob your friends in. Can also be a drinking game. Each person who has done the said thing must drink. If no one has done that thing, the person in the middle must drink. we do it with drinks though, kids use juice. if a person has done that thing they take a drink. kewl icebreaker and a good way to clear the bar. Some friends won't tell if they have done it before.....but other than not finding anything out about peopl....AWESOME!